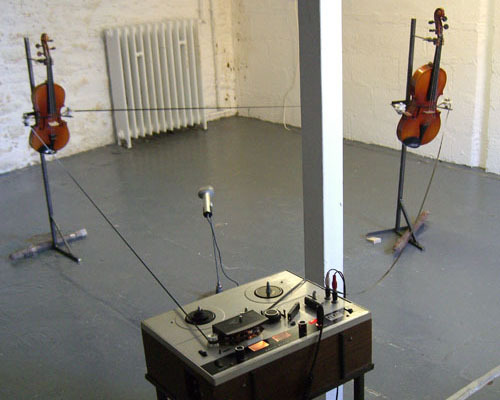 A loop of quater-inch tape is threaded over the strings of a violin and viola, driven by a reel-to-reel machine which records onto one side what its plastic backing is playing a few feet away. Taking its lead from the 60s experimental strategy of musicans playing alongisde a live recorded loop of themselves. Here the musician is absent, the tape loop left to simultaneously play and record the instruments alone.